Those of us who’ve been going to the State Fair of Texas every year since we were kids have favorite food stands that are mandatory stops for the first day of the fair. These include such popular items as Fletcher’s Corny Dogs; Belgian waffles, turkey legs or funnel cakes. It doesn’t matter how long the lines are, we simply have to stop at these stands. This year fairgoers have some tasty new fried foods to try, with the recent announcing of three 2018 Big Tex Choice Awards winners. “Best Taste – Savory” was won by the Hoppin’ John Cake with Jackpot Sauce by Winter Family Concessions. Winning Best Taste—Sweet: Arroz con Leche (or Sweet Crispy Rice) by the Garza Family; and “Most Creative”– Cotton Candy Taco by Justin & Rudy Martinez. Fernie’s Hoppin’ John Cake with Jackpot Sauce is a unique take on a traditional New Year’s Eve “good luck” dish. The classic ingredients of creamy, nutty black-eyed peas, fluffy white rice, spicy smoke sausage, green onions, and a secret blend of special spices are mixed with bread crumbs and eggbeaters to form a Texas-sized cake. Then, the cake is deep fried and topped with a zingy black-eyed pea relish, garnished with pickled okra, and served with a side of Jackpot sauce. Arroz con Leche (Sweet Crispy Rice), a delectable cinnamon spiced rice ball formed, battered, and coated in crispy puffed rice cereal. The ball is then deep fried to golden perfection. Cotton Candy Taco won Most Creative for a sweet creation that starts with a graham cracker waffle cone batter and squeezed into a crunchy taco shell shape. The taco is then coated with a marshmallow glaze and stuffed with chocolate, toasted marshmallow, and organic cane sugar cotton candy. The taco is topped off with chocolate cookie crumbles and two chocolate cream-covered biscuit sticks with marshmallows. 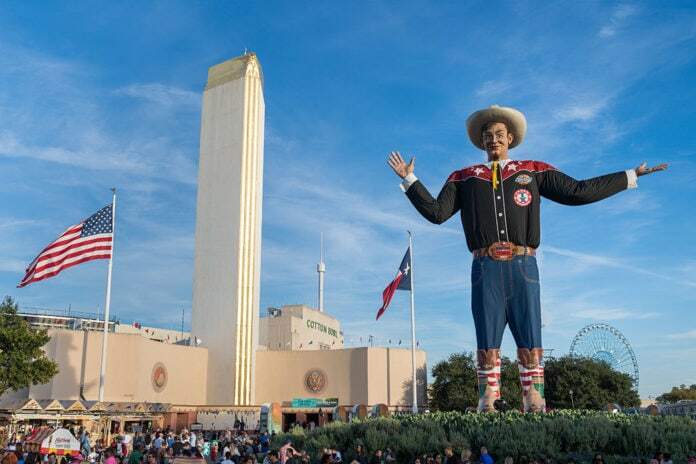 Other finalists for the 2018 Big Tex Choice Awards that will be offered at stands throughout the fairgrounds include Texas Fried Hill Country by Justin and Rudy Martinez, Deep Fried Shepherd’s Pie by Clint Probst, Deep Fried Skillet Potato Melt in a Boat by Tom Grace, Fernie’s Orange You Glad We Fried It?! by Winter Family Concessions, State Fair Fun-L Cake Ice Cream by Tom Landis, Sweet Bakin’ Bacon by Ed and Eddie Campbell, and Texas Twang-kie by Chris and Sherry Howard. Judges were Bobby Abtahi – City of Dallas Park & Recreation Board President; Uno Immanivong – Chef and Owner of Chino Chinatown in Trinity Groves and Red Stix in Legacy Hall; Alvaro Luque – President & CEO at Avocados From Mexico; DeDe McGuire – K104 FM “DeDe in the Morning” Show Host; Doug Pickering – Pitmaster of Ferris Wheeler’s BBQ; D’Andra Simmons – Founder and CEO of Hard Night Good Morning and TV Personality. Audience member Laurence Michlin of Prosper whose ticket was picked from a random drawing filled the final slot, representing all fairgoers. Leading the awards ceremony as emcee was once again local radio host Michelle Rodriguez of New Country 96.3 KSCS. 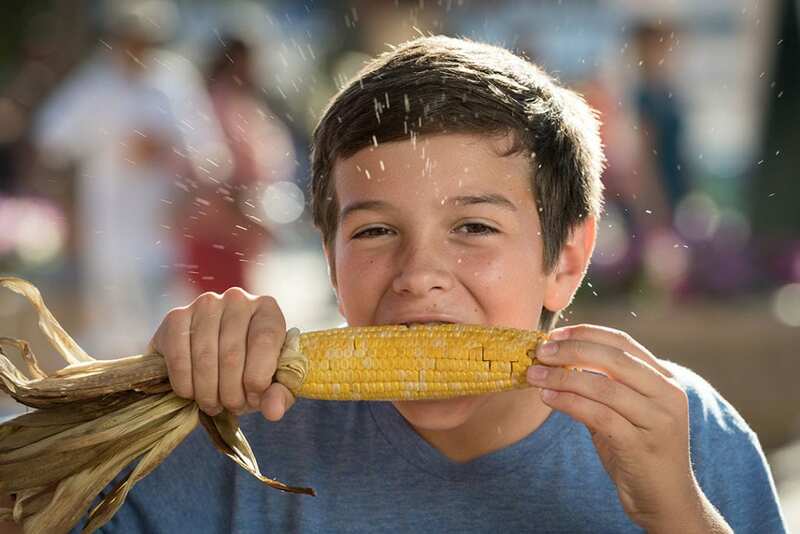 Pick up a Visitor’s Guide, which includes a food map that lays out the vendor locations for each of the finalists, or check out the new food finder on BigTex.com to map out your route and hit all the hot spots along the way. Visitor’s Guides will be available at State Fair Information Booths, as well as online at BigTex.com. Opening its doors to the public for the first time in 2014, the Big Tex Choice Awards offered a limited number of State Fair fans the chance to attend and serve as taste tasters for the food finalists in the annual competition. Building off the success of the past few years, the Fair once again sold tickets to the event, with all proceeds going to the State Fair of Texas Scholarship Program. The 14th Annual Big Tex Choice Awards, presented by Vistaprint, proved to be an equally successful event. Over its 26-year history, the Scholarship Program has awarded scholarships to more than 2,200 students for a total of more than $11.3 million. Eligible recipients include graduating high school seniors from around the state of Texas who have competed in State Fair youth livestock events, as well as graduating seniors from five Fair Park-area schools, and finally, eligible seasonal employees or their dependents. For more information on the State Fair of Texas Scholarship Program, visit BigTex.com/Scholarship.